For Ellery's 7th birthday in May she received her own sewing machine and two gift cards to JoAnns Fabric. I took her to pick out a pattern and material 3 months ago. 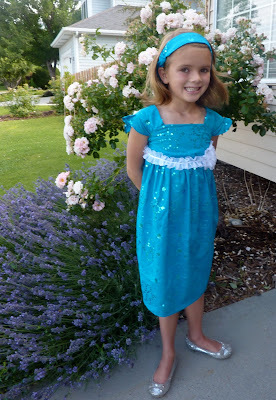 She chose a little dress and teal, sequined material. Sometimes I really struggle to keep myself out of the decision making process. I didn't have her vision, but she had an eye. Cutting the pattern and material were not as glorious as she envisioned. But anytime she got to use her machine she was in raptures. 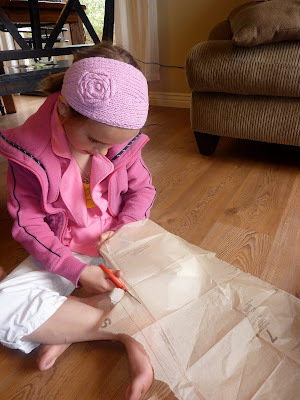 The dress we were making was for her upcoming piano recital. We finished cutting and the sleeves, only to have me thrown back on bedrest. The sewing machine was put away, and we pulled out an equally sparkly, Christmas dress from Mimi for the recital. She insisted on wearing the bodice while finishing the skirt. The end result was darling, and just in time for her next piano recital. We finished this morning about an hour before her recital started! After the recital, I took Ellery out to lunch and then we did a little grocery shopping at Costco. It was wonderful because at least four random strangers stopped Ellery and commented on her beautiful dress. What a boost. I was so proud of her. Oh my gosh I love it, I didn't even know they made sewing machines for little girls! Adorable!!! She should be so proud.